*Kanye West ended this weekend’s Coachella music festival on an emotional note by dedicating his headlining set to his late mother. The rapper took the stage Sunday night to bring the Indio, California event to a close following three days of performances from bands including Arcade Fire and The Strokes. According to WENN, West began the show suspended high above the crowd on a futuristic crane, performing his first track, Power, as he was carried to the main stage, where he was greeted by 30 ballet dancers. He went on to rock his hit singles “Gold Digger,” “Stronger” and “Love Lockdown,” while he was joined by Pusha T, his only special guest, for “Runaway.” He was watched from the VIP area by the likes of Usher, Dave Chappelle and Erykah Badu. 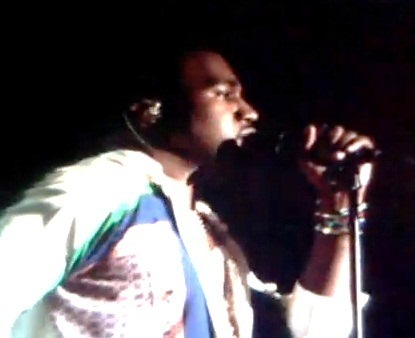 As the concert was coming to an end, the artist announced his Coachella set was the “most important show” since his mother, Dr. Donda West, died suddenly in 2007 after suffering fatal complications from cosmetic surgery. However, the rapper’s spectacular show may have landed him in trouble with festival organizers – he started his performance late and is now reportedly facing a hefty fine after running over the midnight curfew by 20 minutes. Watch clips from his performance below.